Truck Drive is a realistic truck driving simulation with stunning 3D graphics, realistic truck physics and addictive gameplay. Experience the thrill of driving powerful high speed race trucks through 9 realistic tracks. Play as a tractor truck driver and prove yourself by competing with other truck drivers. 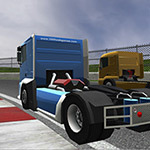 Drive the truck on race tracks and win all the opponents. Earn points, unlock new tracks and get cash for purchasing faster race trucks.